Flat design is everywhere these days, almost to the point of parody. Now, even state flags have been given a flat makeover, courtesy of a creative agency based in Washington D.C. The result is a set of pretty flags that basically look like the state flags turned into app icons. 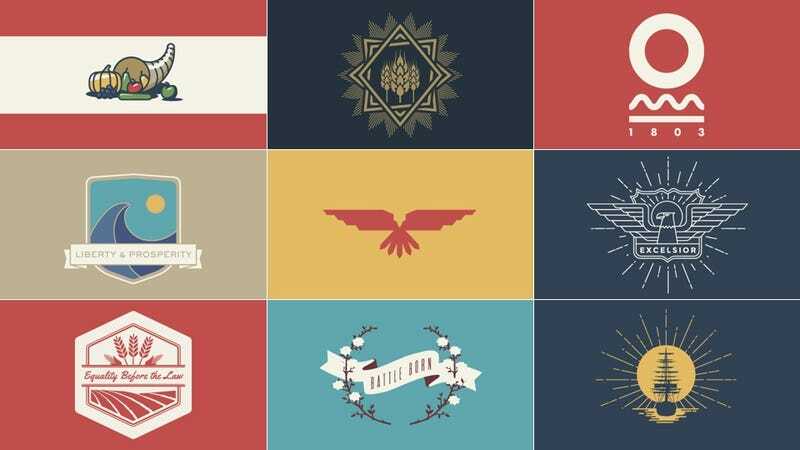 NJI Media, a D.C.-based creative agency, decided to redesign all 50 state flags in honor of flag day tomorrow. Our current state flags are already unique (and sometimes hilarious), and most of them were adopted in the 1890s when states wanted to represent themselves at the World's Fair in Chicago with unique symbols. So most of them have been around for more than a century. Check out each of the flags below, along with NJI's description of its design. And tell us: Do you think it's a change for the better? "Alabama is known as the Cotton State. The redesigned flag pays homage to Alabama's historic agriculture. Agriculture was an integral part of Alabama and cotton in particular was a major force in their economy." "The State of Alaska is revered for its natural beauty, and is officially known as 'The Last Frontier.' The new flag design takes inspiration for its blue color field from previous versions of the flag, depicting snow-covered mountains and a reference to the midnight sun that occurs during summer months." "The Arizona state flag has a sparse design with a central image consisting of a sun and cactus. These are references to the arid, desert landscape for which the state is known. The sun features seven rays, creating thirteen divisions for the thirteen original states. This imagery is inscribed within a circle that symbolizes the mile-wide Barringer Meteorite Crater found in the Northern Arizona desert." "The new Arkansas flag design features a solid green color field and a representation of a pine cone, both of which reference its nickname, 'The Natural State.' The pine cone is contained within a diamond, a nod to the state's diamond production and previous versions of the flag." "The California state flag features a California grizzly bear, which is the official animal of the state. The star and bear are references to the Bear Flag that was raised during the Bear Flag revolt of 1846, and the red stripe and color field are nods to the Bear Flag of 1911. Its single star honors the 1836 California Lone Star flag." "The official motto of the State of Colorado is 'Nil Sine Numine,' which translates to "Nothing without providence." The new flag features an icon combining three mountains with the All-Seeing Eye (or Eye of Providence), referencing the motto." "The Connecticut state flag consists of three grape vines bearing fruit. This image is featured on the Connecticut Coat of Arms, which originated on a seal Colonel George Fenwick brought from England in 1639. The three bunches of grapes represent the three colonies that were joined as Connecticut in 1665. Below the grapes, the state motto 'Qui Transtulit Sustinet' ('He who transplanted still sustains') is prominently featured." "The motto of the state of Delaware is 'Liberty and Independence,' which is displayed prominently on the new flag design as a reference to Delaware's status as the first state to ratify the United States Constitution. In addition, the flag features a ship under full sail, a nod to the state's history of coastal commerce. The color field symbolizes the importance of the Delaware River." "Florida is widely known as the 'Sunshine State.' With its reputation for year-round sunshine, no state is better suited for an iconic sun image than the State of Florida. In addition, a red saltire marks the center of the flag, an allusion to the Spanish settlement of Florida." "The central element of Georgia's new flag hearkens back to an image from Georgia's coat of arms, an archway to symbolize the state's Constitution with three columns to symbolize the three branches of government operating under that document." "The Hawaii state flag draws its iconographic inspiration from a Hawaiian Coat of Arms used during the 19th century. The central image is a triangular banner, which was often displayed by ancient Hawaiian royalty as a sign of nobility. Used in conjunction with crossed spears, it represents royal protection. The state motto, 'Ua Mau ke Ea o ka 'Āina i ka Pono' (The Life of the Land is Perpetuated in Righteousness), is intertwined with the central icon. The depiction of a single star is a reference to the Great Seal of the State of Hawaii." "The Idaho state flag draws its inspiration from scales used on the Idaho State Seal, which are a symbol of justice and balance. This symbol is inscribed within an illustration of the state motto, 'Esto Perpetua.' Latin for 'Let it be perpetual,' the motto calls for the enduring prosperity of the state." "The Illinois state flag features a shield bearing thirteen stars and thirteen stripes to represent the original colonies of the Union. This image appears on The Great Seal of the State of Illinois, a reference to the Great Seal of the United States. Illinois is an Algonquin word for 'tribe of superior men,' and in this vein, the gold border around the flag and the shield symbolize the protection of the state of Illinois." "The state flag on Indiana bears a golden torch. This large, bold icon represents liberty and enlightenment. The blue color field ties the Indiana flag to the flag of the United States of America." "The new Iowa state flag features three vertical stripes which reference the colors of the flag of the United States of America. The main element of the flag is the American bald eagle, referencing the original flag and The Great Seal of the State of Iowa." "Kansas named the sunflower its official State Flower in 1903. The sunflower is represented on the state flag and state quarter, its nickname is 'The Sunflower State' and sunflowers are one of the main agricultural products of Kansas. As such, it seemed only fitting to focus the new flag design around a modern representation of the sunflower." "In Kentucky, the state horse is the thoroughbred, featured on the state quarter. The thoroughbred is an important symbol to Kentucky, as the state is well known for the Kentucky Derby and horse racing overall. The colors, blue and gold, stay true to the colors of Kentucky's original flag." "Early European settlers were impressed with the pelican's generous and nurturing attitude toward their young, and the brown pelican has been a symbol of Louisiana since that time. Louisiana's official nickname is "The Pelican State" and the brown pelican appears on the state flag, seal, the official state painting, and is one of three Louisiana symbols displayed on the U.S. Mint's bicentennial quarter. Louisiana designated blue, white, and gold as the official state colors in 1972." "The motto 'Dirigo' (translated from Latin as 'I Lead') was adopted when Maine entered the Union in 1820. Since that time, it has been featured in several versions of the Great Seal of the State of Maine in conjunction with the North Star. The new flag design maintains a blue color field to reference the blue of the flag of the United States, while distilling the motto and North Star into a simple icon." "Maryland's main symbol was taken from the existing flag which is a symbol of Maryland's founding family, the Crossland family that included George Calvert, first Lord Baltimore. Their symbol is called a 'cross bottony,' with red and white Crossland colors. Around the cross bottony Fatti maschil, Parole femine and 1632 are shown. The first was adopted as an element of the Great Seal of Maryland, and has been accepted as a state motto. In the year 1632, Lord Baltimore II was given a land grant that created Maryland." "The Massachusetts state motto is 'Ense petit placidam sub libertate quietem.' This means, 'By the sword we seek peace, but peace only under liberty.' For this reason, it surrounds a bow that points upward to represent peace. The star represents Massachusetts as one of the original thirteen states." "The Michigan state flag pulls symbols from the state seal and its reputation for industry. The antlers interchangeably represent those of the large white tailed deer, the state mammal, and the elk Michigan features on its seal. As a nod to Michigan's automotive and industrial history, the ends of the antlers are adorned with the features of a wrench. The antlers surround the inscription E Pluribus Unum, which translates to 'From Many, One.'" "Minnesota's state motto is 'The Star of the North.' Feathers arranged in a star shape symbolize the motto, and they also remark on the Native American heritage of Minnesota. The sunburst behind the star represents the Western Horizon and the flat plains that cover most of the state." "The mighty Mississippi river runs along almost the entire western boundary of the state of Mississippi. The state is well known for the river, named after the it. The compass rose, partially obscured by a line signifying the river, remembers men and women who navigated the water, settled the land and prospered from the flows of the Mississippi." "The Missouri flag prominently features a symbol that combining a grizzly bear and a bald eagle in silhouette. The grizzly represents courage and strength, while the eagle is a greater tie to the United States. The crescent moon, symbolizing the 'second son,' as Missouri was the second state formed from the Louisiana Territory. The logo also bears the state motto: Salus Populi Suprema Lex Esto (Latin for 'Let the welfare of the people be the supreme law')." "The state flag displays symbols of Montana's history and natural beauty. The snowy mountains that gave the state its name feature prominently. Behind the mountains a pick axe symbolizes Montana's mining and farming history. Below the pick's handle is another reference to mining history, Montana's motto, Oro Y Plata, Spanish for 'gold and silver.' To many, Montana is known for its expansive wilderness and unexplored frontier. Because of this many have adopted a new slogan, 'The Last Best Place,' also featured on the new flag." "Nebraska is the Cornhusker State, widely successful thanks to its hardy agricultural industry. This state flag is adorned with corn stalks and sheaves of wheat displayed proudly over lush farmland. The center of the seal retains the state motto, 'Equality Before the Law.'" "Nevada became the 36th state to enter the union in 1864, and the phrase 'Battle Born' on the state flag reflects the state's entry on the Union side during the American Civil War. It is surrounded by sagebrush, a native plant Nevada designated as the official state flower in 1917." "New Hampshire's flag depicts the frigate Raleigh, built in 1776 at Portsmouth as one of the first thirteen warships for a new American Navy sponsored by the Continental Congress. It's also an homage to New Hampshire's fishing industry, historically was one of the state's main economic resources. The sun behind the frigate is an old state symbol of New Hampshire, which alludes to Portsmouth becoming a major shipbuilding center during years of war." "New Jersey's flag is a representation of their popularity as a beach resort and their success in the shipping industry. Many know New Jersey for the tourist destinations and bustling shoreline, which the main shield on this flag references. Their motto Liberty and Prosperity is inscribed in the crest." "The Mexican eagle on this flag was inspired by an ancient Aztec myth and symbolizes that New Mexico treasures its Spanish, Mexican and Native American traditions. The official colors of New Mexico are the red and yellow of old Spain, unmistakable on this new flag." "The iconic image of the American bald eagle with outstretched wings features prominently on the New York state flag and state seal. As such, it seemed fitting to represent the eagle as the central design element for the New York state flag. Beneath the eagle, a banner displays the New York State motto, 'Excelsior' (translated from Latin as 'Ever Upward')." "The North Carolina flag features the horn of Plenty, which is depicted on The Great Seal of the State of North Carolina. It is a symbol of the hope for sustained abundance and prosperity for the state. The red and white color field unify the North Carolina flag with the flag of the United States of America." "North Dakota is the largest grain producing state in the US. It's state flag pays homage to its agricultural wealth. The grain illustration references their crop production capabilities directly. The layered boxes surrounding the grain symbolize the complexity and importance of agriculture. Radiating lines symbolize life's key component, the sun." "Ohio became the 17th state in 1803. Almost 100 years later, the Ohio state flag we know today was adopted. Roads and waterways are a main theme in Ohio's current flag. In keeping with that theme but with a minimalist approach, waterways and roads were represented with a wavy line and a straight line. An "O" for "Ohio" sits on top to tie everything together." "The official state motto of Oklahoma is Labor Omnia Vincit, meaning 'Labor Conquers All Things' and together, the Anglo and Native American peoples were able to do just that. The equal justice shared between these two nations is represented by the Native American hatchet/calumet pipe and the American pioneer hoe, which are crossed in the center of the flag. Below this are five feathers, each one representing the Five Civilized Tribes of Oklahoma – Cherokee, Chickasaw, Choctaw, Creek, and Seminole, all of whom have a major presence in the state." "In order to accurately reflect the state of Oregon's independent spirit, it was necessary to retain as much of their current flag as possible. The escutcheon, or heraldic shield shape, is now outlined by branches formed by nature's engineer and Oregon's state animal, the American Beaver. Draped across the escutcheon is a banner that reads, The Union, formerly the official state motto this adage refers to the state of Oregon's movement to form a provisional government separate from that of the United States due to conflicting views about slavery. Below the banner are a field of 33 stars and the year 1859 which represent Oregon's admission into the nation as the 33rd state and the year which that occurred." "Affectionately known as 'The Keystone State' for playing an integral role in the vote for independence, Pennsylvania's state flag proudly features this central archstone. This necessary architectural element is used within archways to lock all the other pieces into place. Inscribed on the keystone is the state motto, Virtue, Liberty and Independence and crested atop it is the American bald eagle, which signifies Pennsylvania's loyalty to the United States." "Widely accepted as a symbol of hope, the anchor proudly stands as visual representation of the state motto of Rhode Island. It is surrounded by thirteen stars one for each of the original thirteen colonies, Rhode Island being the last of those to ratify the Constitution. The anchor is submerged in water to signify the state of Rhode Island's official nickname, 'The Ocean State.'" "Serving as a tribute of the heroic efforts put forth in defense of Sullivan's Island, the flag of the state of South Carolina depicts twelve intertwined gold spears upon a blue background. The South Carolina troops bravery shown in the defeat of the then unconquered British fleet served as a symbol of the American Revolution, helping to unite the nation. Each of the first twelve states of the union is represented as a spear posing the question Quis Separabit?, or 'Who Will Separate Us? ', which is the state motto of South Carolina." "Rising from the ground out in the western region of South Dakota are a small, isolated mountain range known as the Black Hills. Most notably including Mount Rushmore, these mountains are home to some of the nations greatest national monuments, which is why this small yet significant hillside is prominently featured on the state flag. Emerging from the Black Hills is the official state animal, the coyote. Below that reads the state motto, Under God the People Rule, followed by the year the state was admitted into the union, 1889." "Each constituting roughly one-third of the state, the three Grand Divisions of Tennessee are are geographically, culturally, and economically distinct. Categorized as East, Middle, and West Tennessee, these regions are represented by the three white stars on the state flag. The three stars are enclosed within a blue circle representing the unity of the three divisions. Also staged within the circle are three rivers representing the Tennessee River, the Cumberland River, and the Mississippi River, symbolizing the importance the river trade was once to the state of Tennessee's economy. The roman numeral 'XVI' signifies Tennessee's admission into the union as the sixteenth state." "Known as 'The Lone Star Flag', the Texas state flag is indicative of the independent spirit that the inhabitants of the state embody. The single white star, or lone star, in the middle of the flag represents the entirety of Texas and stands for unity as one for God, State, and Country. Each color on the flag has a specific meaning as well, the blue stands for loyalty, white for purity, and red for bravery." "Officially known as 'The Beehive State', the flag of Utah proudly features a honeycomb structure in the forefront. Festooned below the beehive is a red banner upon which the state motto, Industry is inscribed. Both the beehive and the motto are representative of the progress and hard work the people of Utah strive to live by. A pair of sego lilies, which are the official state flower, adorn the side of the beehive, signifying peace." "Paying homage to the Green Mountain Boys, the Vermont militia established in the late 1760s, the state of Vermont flag carries a constellation of thirteen five-pointed white stars arranged in a natural pattern. Below the stars lay the Green Mountains, a formidable mountain range that spans much of 'The Green Mountain State.' Their motto, Freedom and Unity, is also displayed and represents two different ideals: the freedom of the individual citizen, and the welfare of the common good." "The motto of the Commonwealth of Virginia is "Sic semper tyrannis," which translates to "Thus Always to Tyrants," referencing release from British rule. The downward-facing spear represents peace, and points to the fallen crown of Tyranny. This symbol is framed within an ornamental border of 10 divisions, referencing the Commonwealth as the 10th state admitted to the Union." "When thinking of Washington state, George Washington probably comes to mind. He's immortalized on the current flag of Washington. Nothing against GW, but Washington is also known for its landscape as the Evergreen state. It's covered in some of America's most amazing forests. The group of pines is a simple reminder of the lush beauty of great state of Washington." "West Virginia is known for its mining industry but is also known for scenic views of the Appalachian mountain range. The overlapping mountains represent that important geographical trait while the latin text pays homage to the origins of the people of West Virginia. 'Montani Semper Liberi' means 'Mountaineers are Always Free'." "Wisconsin is usually only associated with cheese and dairy production. While the dairy industry is the most prominent industry in Wisconsin, it does not define the state. Wisconsin's motto is 'Forward'. That motto is a reminder that work is never done. The large text serves as a call to action, while the slanted horizontal lines express motion." "Wyoming was the first state in the U.S. to grant women the right to vote. Equality is a huge part of the state's history. The equal sign is a bold representation of Wyoming's equal rights accomplishments."